Late Friday it looked like the surrender of the establishment GOP was almost complete as they announced their latest plan to end the federal government “slimdown” and avoid the prospect of allowing President Obama to claim that the Republicans had forced the government into default when it hits the debt ceiling sometime this week. · Other budget and spending issuer would be addressed in negotiations led by House Budget Committee Chairman Paul Ryan to take place only after the government is reopened and the threat of default eliminated. Fortunately for Republicans, Obama said “NO” to the Collins proposal. Republican nervousness over their poll numbers on the federal government “slimdown” is ridiculous – as Rush Limbaugh pointed out – Obama’s approval is at 37 percent and they think they are losing? And Rush’s comments came before the release of a Fox News national poll that asked voters to imagine being a lawmaker and having to cast an up-or-down vote on raising the debt ceiling. That poll showed that 58 percent would vote against raising the debt ceiling, while only 37 percent would vote in favor of it. More importantly for the House GOP, most Republicans polled (78 percent) and a majority of independents (57 percent) would vote against raising the debt limit. So would almost all Tea Partiers (88 percent). You can see the details of the Fox News poll through this link. Fox reported that even Democrats, by a 48-42 percent margin, are more likely to say spending cuts must accompany an increase in the debt limit. By wide margins Republicans (77 to 11 percent) and independents (65 to 26 percent) would require cuts in government spending before agreeing to raise the debt ceiling. Even with these, and other polls showing substantial public support for reducing spending and getting the federal government’s fiscal house in order, it seems that the Capitol Hill establishment Republicans who are (until the next election) in charge of the Republican negotiations just can’t seem to accept that We the People actually want them to hang tough on spending, the debt and defunding Obamacare. Every time a debt ceiling or other deadline nears, which is the point when the Constitution contemplates legislators will act to rein-in spending by an overambitious Executive branch, the Republican establishment blinks and promises to hang tough the next time. Obama and Harry Reid saved establishment Republicans from themselves by rejecting the Collins proposal. Obama and Reid have now made the debt ceiling an all or nothing fight and even Speaker Boehner and Republican Senate Leader Mitch McConnell must recognize that if they cave-in completely and give Obama everything he wants then that’s the end of their leadership, and perhaps the end of the Republican Party as well. 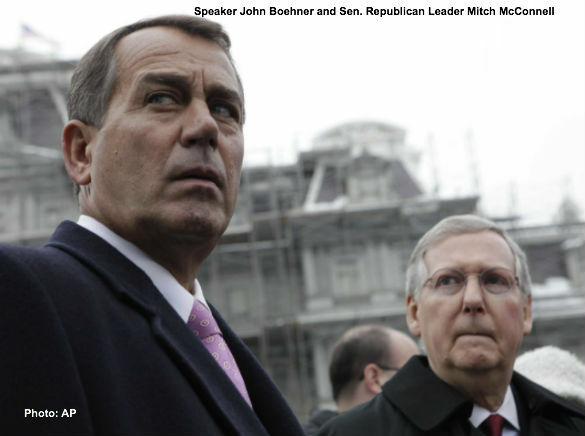 Are Boehner and McConnell Ready for an "All or Nothing" Battle? Submitted by jwagner on Tue, 10/15/2013 - 00:14. This is WWII all over again, except it is in reverse. The allies fought an “Unconditional Surrender” war against the Hitler and Hirohito and absolutely refused to negotiate any form of peace terms. Today, Obama is fighting an “Unconditional Surrender” war against Boehner, McConnell, and the other wimpy Republicans, while they beg to negotiate a compromise. The Republican Regime wimps of today have no understanding of principled leadership like the Greatest Generation did. All Republicans need to walk across the street to the Allan P. Kirby, Jr. Center for Constitutional Studies and Citizenship, sponsored hy Hillsdale College, and learn what it means to be an American. Submitted by al.78.1931 on Mon, 10/14/2013 - 18:28. Defund Obamacare no ifs an buts even lt means defaulting the debt. Even after default we Americans have been there before, we will survive and become stronger. Submitted by buffalocalfmother on Mon, 10/14/2013 - 13:08. I have attempted to call Boehner's office, I guess his phone system is antiquated because I always have to leave a message or the memory on his system is full. I more than suspect he is afraid to hear from Americans that disagree with his tactics. I actually got a campaign donation request from McConnell, I hope the poor little fund raiser that had to read my retort didn't cry, when they finished, if they finished my response. Obama has made the greatest country on the face of the earth into a laughing stock. Submitted by neal.hightower1 on Tue, 10/15/2013 - 10:37. If you go to bing.com and search contact Speak of the House you can get his site and can email him, too.